DAY 93. You know this expression, “it was an uphill battle.” I can’t help but think how this little saying characterizes my work with Solar. Now, this is not to imply that our time together hasn’t been enjoyable, or that it has been antagonistic in nature. On the contrary. However, this entire process has been about making the uphill effort, one inch at a time, both literally and figuratively. Solar had years of experience going around on his forehand. That is, he balanced more of his weight over his front legs than his hind legs. In the horse-world this is called “downhill.” The trouble with being downhill is that it’s not the most athletic stance for sporting purposes, and over time riding a horse who is on their forehand can lead to health or lameness issues. Inch by inch, step by step, I’ve been teaching Solar to rock back on his hindquarters and discover a new way of going. Unlike the horses that came directly from the track, Solar was not particularly fit. Though he was mentally and physically sound and healthy, which a break from the track encourages, he had not been in active work. He didn’t have much strength or muscle tone. So, our first sessions together were like hitting the gym again after a long break. We had to ease into strength. Solar is now entering the phase of his training where the real work begins. At first we had to focus on his mental game… Getting to know each other, teaching him to communicate better, and instilling a desire to work. We then worked on building fitness and strength, and revisiting the most basic of cues until he could do them promptly and reliably–go, stop, turn, back, pick up the correct lead, move laterally off leg pressure, etc. He is now ready for exercises that require more coordination, balance, and effort. Solar’s balance (or lackthereof) most impacted his canter. From what I can tell from the other trainer’s videos, Solar had the most disorganized canter of all the horses. It’s not that he isn’t capable of sitting back and cantering very well, it’s just that he’s been cantering around on his forehand for years. Many racehorses pull themselves along when galloping instead of pushing from behind, and I don’t think Solar received a lot of training beyond the track aimed at correcting his canter specifically. So, for four or so years Solar had plenty of practice being on his forehand. Breaking an old habit is much harder than starting a new behavior (studies back this up). 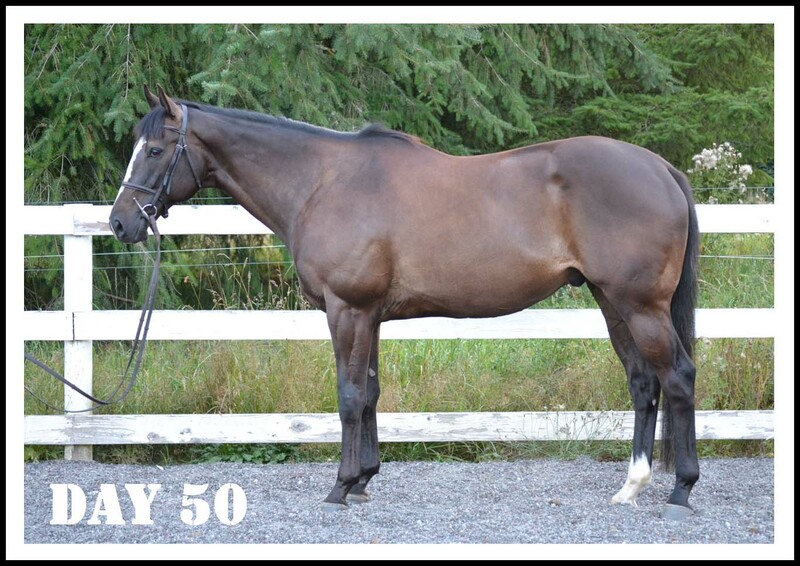 This is one reason why starting young horses under saddle is often much easier work than taking on horses for retraining. However, systematic repetition, patience, and always focusing on rewarding good effort will pay off in the longrun. 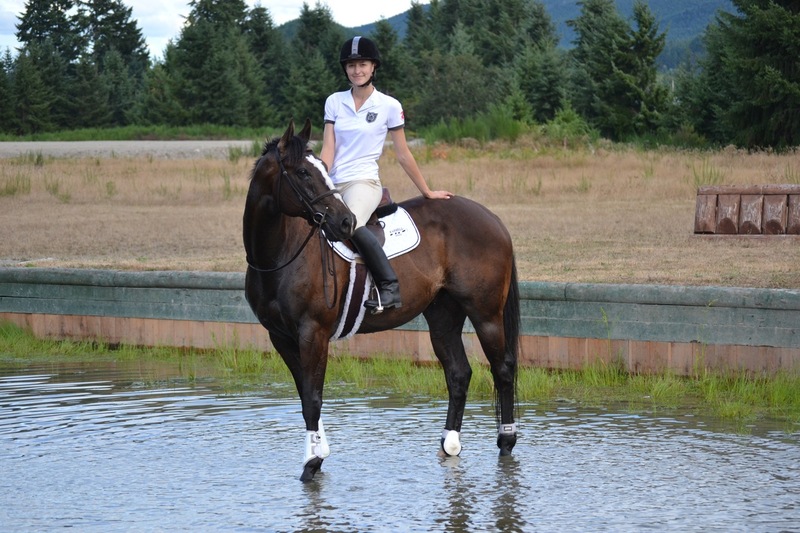 Even the most “messed up” horse or rider can be retrained. During moments when Solar comes together in a balanced frame, he is a joy to ride. You’ll see when he’s unbalanced there is tension in his body, but when he is balanced his movement and frame look and feel effortless. When I feel Solar’s canter come into balance I have visions of flying tempi changes or clearing 4′ jumps. But right now he can only produce and hold that canter for fleeting moments. His next rider will have to work with him to develop it further. Solar, like many horses, will need plenty of repetition to produce a polished frame and carry it consistently. Grids for jumping, lateral work for dressage, upward and downward transitions focused on balance… The more he is encouraged to experiment with his balance and work towards improving it (this is not the same as forcing the horse into balance), the more amazing, athletic, and self-correcting he will become. This is the “nitty gritty” part of the training process where you dig and really start to work toward specific goals. It’s time intensive and labor intensive, but as you challenge yourself and your horse you will be rewarded with an ever-growing understanding between you; a stronger relationship. You can see in this grid how the middle oxer stretches Solar out, and he’s using the third fence almost as a speed bump. In theory the third fence should help him sit back and balance after the oxer, but he’s still not quite achieving the balance we’d hope for. Since he’s clever and tidy he did not hit this fence, but it also wasn’t working quite right. However, when I took out the third fence and raised the middle oxer (up to 3’3″) you can see how the previous attempts in the grid with all three fences prepared his balance and focus for the higher fence. Having a horse lock on and willingly leap over a large fence is one of the best feelings in the world. I’m very grateful that I was able to share these jumping moments with Solar. I know a component of the 100-Day Trainer Challenge finale is a judged in-hand class. Even if this wasn’t the case, I would still spend plenty of time working with Solar on the ground. 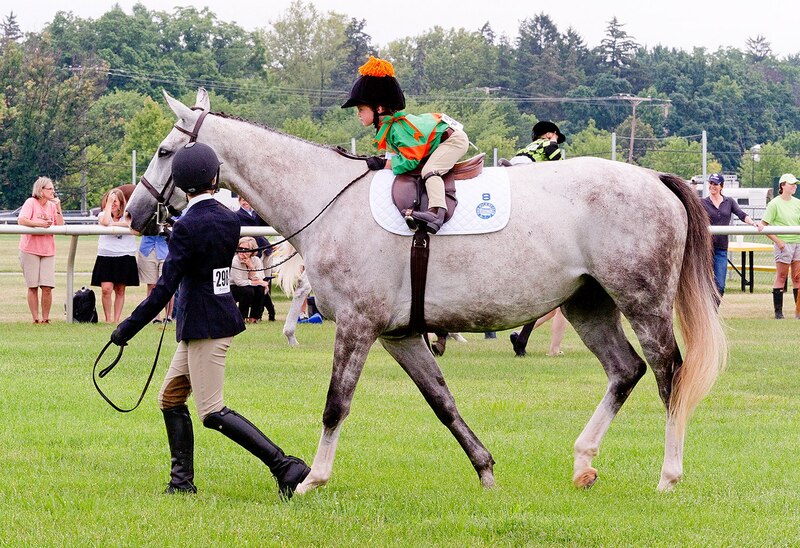 A horse that is prompt, attentive, and coordinated on the ground is much more likely to be that way under saddle. Furthermore, seeing how your horse responds to you on the ground is an excellent way to safely test your communication skills. Ultimately we want a horse that is relaxed, focused, and easily understands his or her handler. So much of our time with our horses is spent on the ground, it’s imperative that we make the most of this time together.